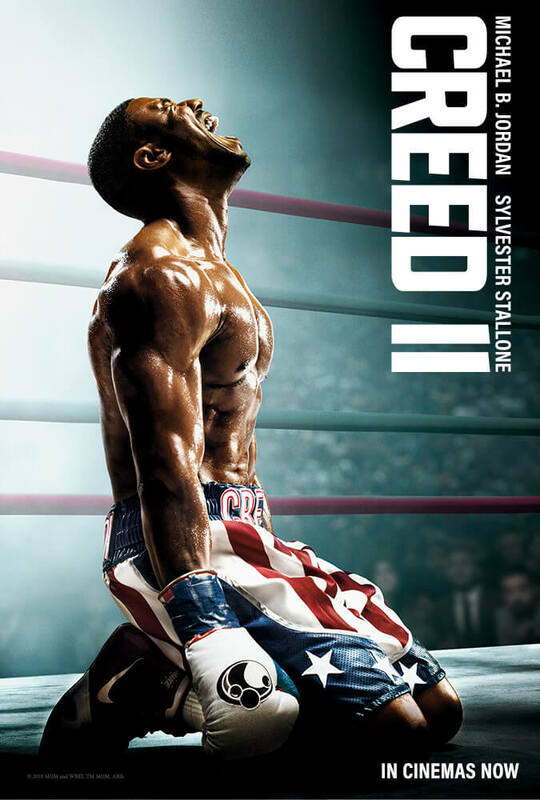 Click here to see a trailer for Creed II. Fan of the series or not, everyone should see Creed II. It is an entertaining, high quality, action-packed, inspirational, emotional, heartwarming movie just about anyone can enjoy. Fans of this franchise are in for a real treat, as Creed II hits all the notes you want from both a Creed sequel as well as a new Rocky installment. It’s hard to imagine anyone who’s a fan not falling in love with this one too. You’ll literally stand up and cheer. 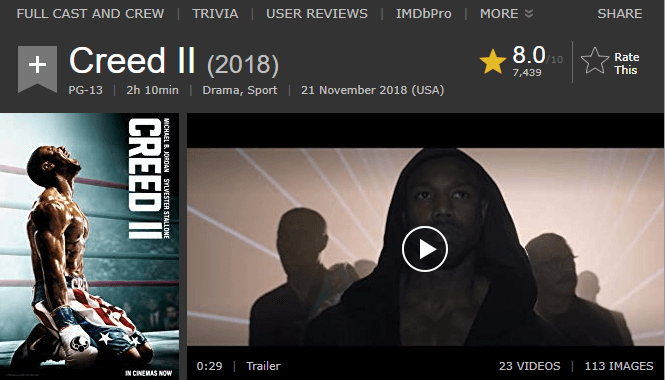 7,439 IMDb users have given Creed II a weighted average vote of 8.9 / 10. Knockout performances from all of the main cast, but in particular Stallone and Lundgren. Users say the way the fight scenes are orchestrated, it will make you feel like you are actually in the fights. Critics on Rotten Tomatoes rated Creed II at an 82% on the Tomatometer. Critics call Creed II an entertaining next chapter that manages to both stand on its own and serve as fun nostalgia for one of the Rocky franchise’s most iconic villains. Critics also say that this movie further cements Michael B. Jordan as a star mostly because of how he portrays Donnie’s personal development. Critics on Metacritic rated Creed II at a 67 on the Metascore board. This average Metascore rating is based on 29 positive reviews, 12 mixed reviews, and 1 negative review. Critics say Creed II is a terrific movie and a boxing picture full of inspired sweetness and shrewd science that honors the cherished traditions of the genre while feeling like something new and exciting is happening. Video game bad guy Ralph and fellow misfit Vanellope von Schweetz must risk it all by traveling to the World Wide Web in search of a replacement part to save Vanellope’s video game, “Sugar Rush.” In way over their heads, Ralph and Vanellope rely on the citizens of the internet to help navigate their way. 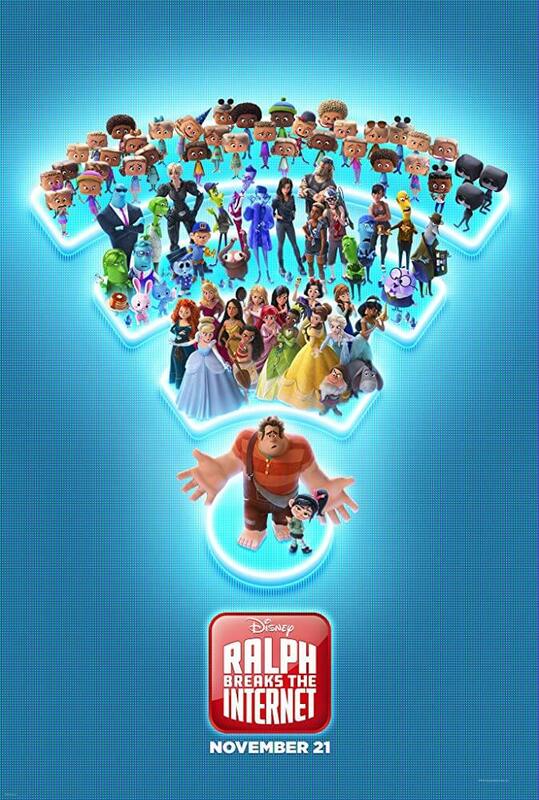 Click here to see a trailer for Ralph Breaks the Internet. Ralph Breaks the Internet is a fantastic movie for the whole family. Ralph Breaks the Internet with all the entertainment, stunning visuals, and dramatic, groundbreaking sequences you could ever need! 8,942 IMDb users have given Ralph Breaks the Internet a weighted average vote of 7.6 / 10 stars. Lots of users are thoroughly impressed with the animation. No surprise, Disney definitely knows how to design and animate the world of children’s imagination. This film also broadens its horizons in terms of laugh factors and allows more people to laugh at the antics at hand. Critics on Rotten Tomatoes rated Ralph Breaks the Internet at an 87% on the Tomatometer. Some critics say in a sense, Ralph Breaks The Internet is like most things online these days; it’s amusing while you’re engaged with it but as soon as your mind is elsewhere, there’s not all that much about it to hold on to. 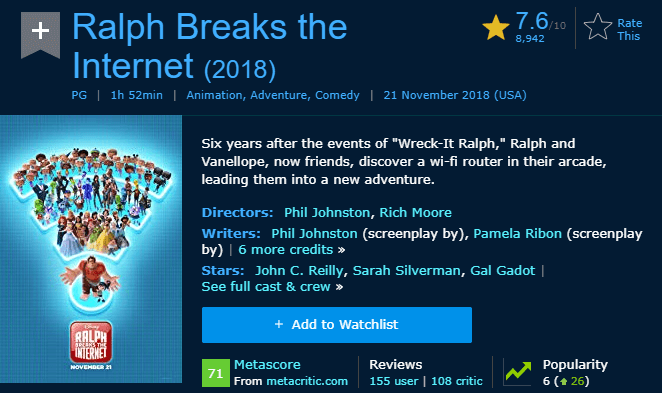 Critics on Metacritics rated Ralph Breaks the Internet at a 71 on the Metascore board. This favorable Metascore is based on 32 positive reviews, 7 mixed reviews, and 1 negative review. Ralph Breaks the Internet is everything that made Wreck-It Ralph enjoyable, painted on a canvas as big as the Internet itself. Critics say the satire is sharp and the pace is relentless. Click here to see a trailer for Robin Hood. 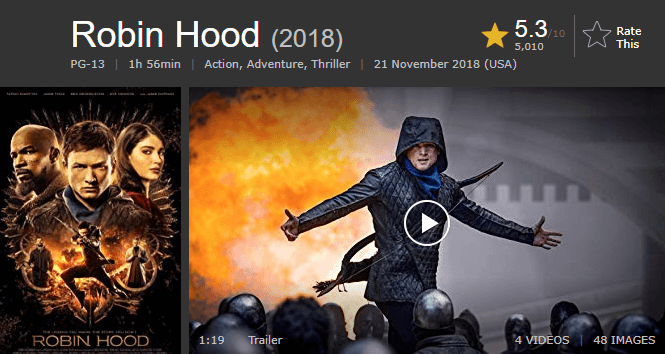 If you love action movies, you will love Robin Hood. This movie is a different version of the classic Robin Hood tale, but unlike the last two adaptions of the famous character, this Robin Hood movie actually has a English actor playing Robin Hood. This fun action movies also includes good stunts and nice aesthetic. 5,010 IMDb users have given Robin Hood a weighted average vote of 5.3 / 10 stars. Users say this is just a standard subpar action movie with a Robin Hood skin. Splashy effects and dialogue give no effort to make it cohesive, new, or worthwhile. Critics on Rotten Tomatoes rated Robin Hood at a 16% on the Tomatometer. 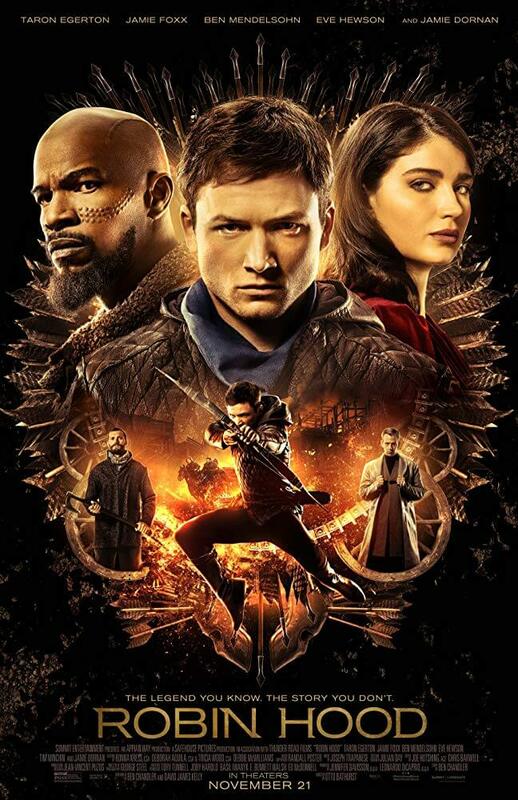 Marred by its attempt to modernize the tale aesthetically, critics say Robin Hood is more miss than hit and deprives some good performances from stars Taron Egerton, Jamie Foxx, and Ben Mendelsohn.